Baby birds, hummingbirds and a "bald Cardinal"
I heard some faint chirping coming from the Cardinal's nest in the boxwood by the carport on Friday. I got the stepstool that I use for photographing moths and peered into the nest. There were 2 tiny, nearly featherless chicks huddled on the bottom. 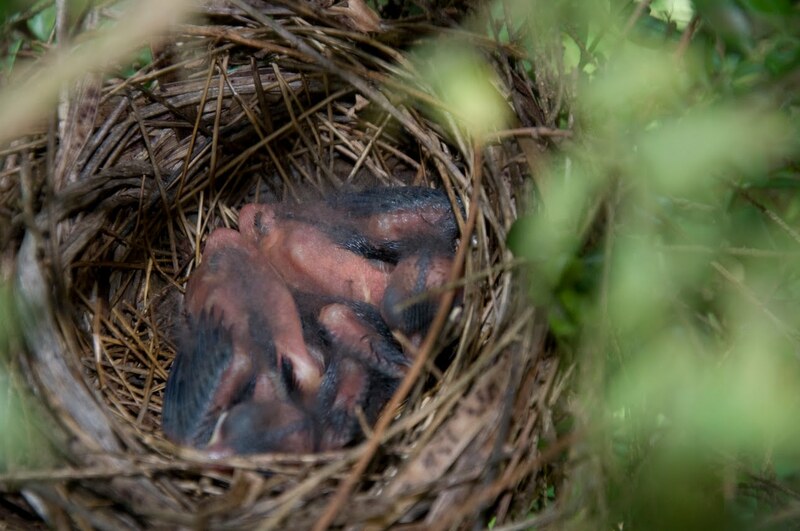 I had to hold the camera above the nest and shoot blindly to get this shot. 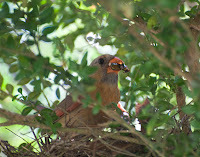 They have very attentive parents, I enjoyed watching them bring food to the nest. I sure hope those are Japanese Beetles in her mouth! This photo of the mother feeding the chicks was shot over the top of the car about 10 feet from the nest and in the shade with my slow telephoto lens, so it isn't as sharp as I'd like. If you notice, the nest is very clean, there are no droppings from the chicks in the bottom. I saw the mother remove the droppings, which are contained in a casing. I don't know if she ate them (yuck!) or if she dropped them on the ground beneath the nest. 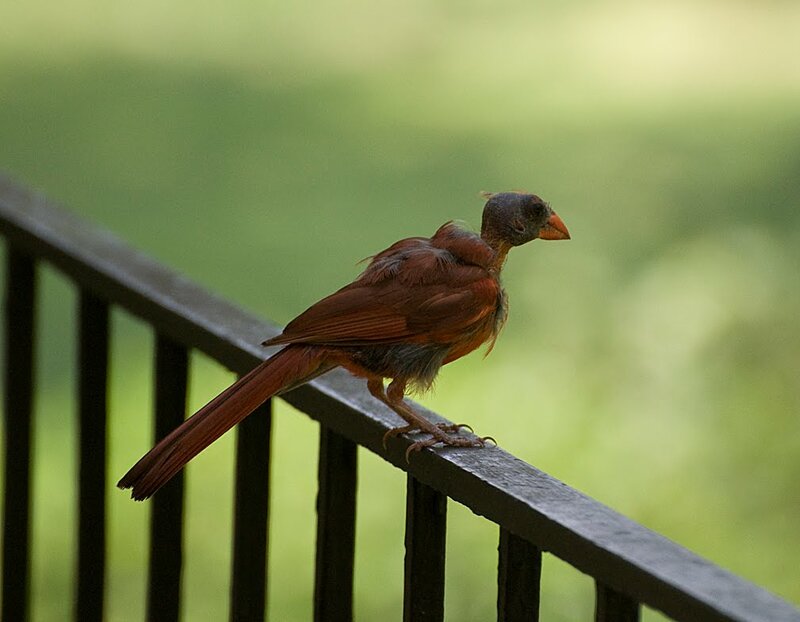 Lately, I've been seeing a scraggly-looking male Cardinal hanging around the front yard. 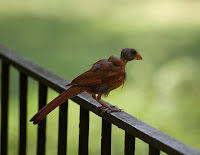 He seemed to h ave a lot of the gray feathers showing. I just assumed he was molting and didn't think much more about it. I was stunned when I saw him again today, but much closer... he was BALD! The poor guy didn't have any feathers on his head or neck! His chest feathers were pretty bedraggled too. I don't know if he has an infestation of parasites (mites, lice, avian "mange"? ), I just hope whatever it is isn't contagious because he is the father of the little chicks! It doesn't seem to keep him from doing his paternal duties though, he has been bringing mouthfuls of insects to the babies. I guess love is blind because the female doesn't seem to notice! :) I just hope this is a temporary condition, I doubt he would survive the winter like this. It has been very hot, maybe he is just trying to keep cool! One interesting thing about this photo though, is that it is possible to see his ear. Notice the hole just below the eye? ***Update: I learned that he does have mites! I just hope he doesn't pass them on to his babies, but I don't see how he can avoid it. 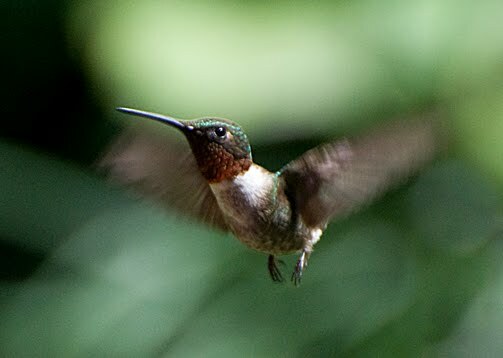 I a lso enjoyed watching the Ruby-throated Hummingbirds as they visited the feeder; there was one male and one female. The Cardinals may have a good "marital" relationship, but not the hummers, they squabble and fight all the time! It seems like they spend more time chasing each other away from the feeder than they do actually eating! I shot this guy as he was coming in to the feeder. 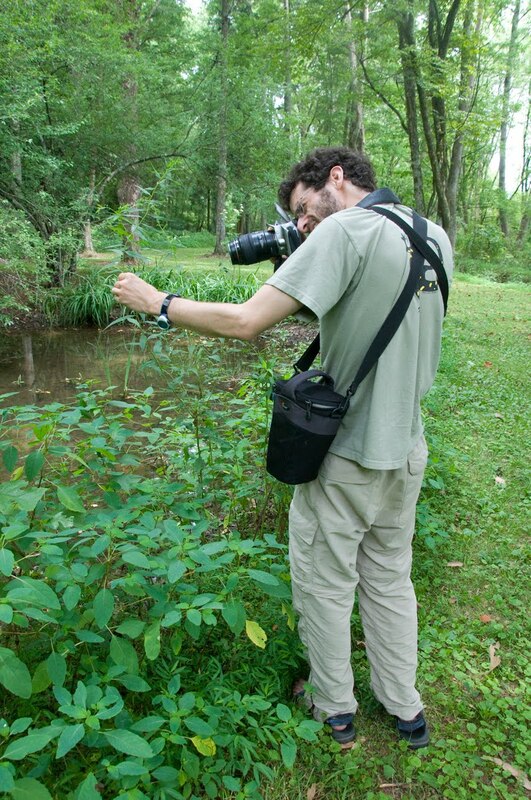 The shot is cropped very tightly. 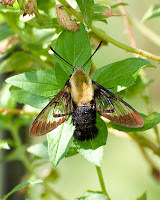 Later, I was happy to see a Hummingbird Clearwing Moth land on a plant on the patio. I think they should be called "Bumblebee Moths", because they look more like them than a hummingbird. I guess it is because they hover in front of the flowers. Speaking of moths, I was thrilled to see a Rosy Maple Moth on the porch last week. They are so pretty with their pink and yellow scales. 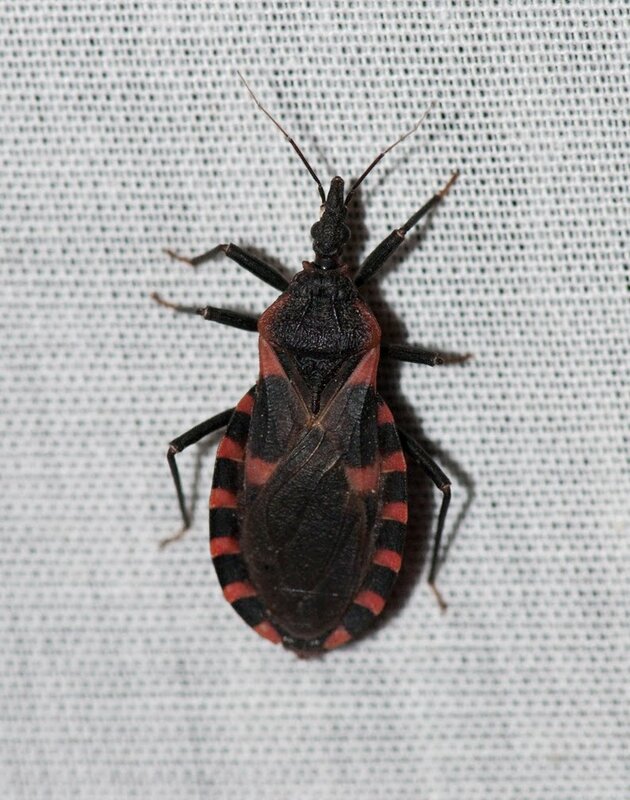 Unfortunately, they can be absolutely insane flying around the black light, the porch light, fluttering all over the sheet and the carport! It is impossible to photograph something that is bouncing around like a Superball in a small room! I finally caught it in a net and gently put it on an Impatiens flower. It gave me enough time to get one shot, then it took off and started going crazy again! 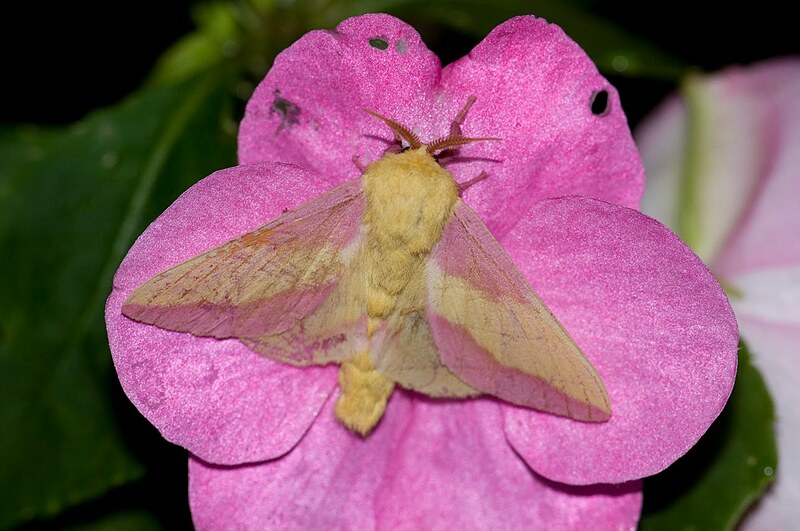 I have documented nearly 140 different moths since June 1, it has been amazing! 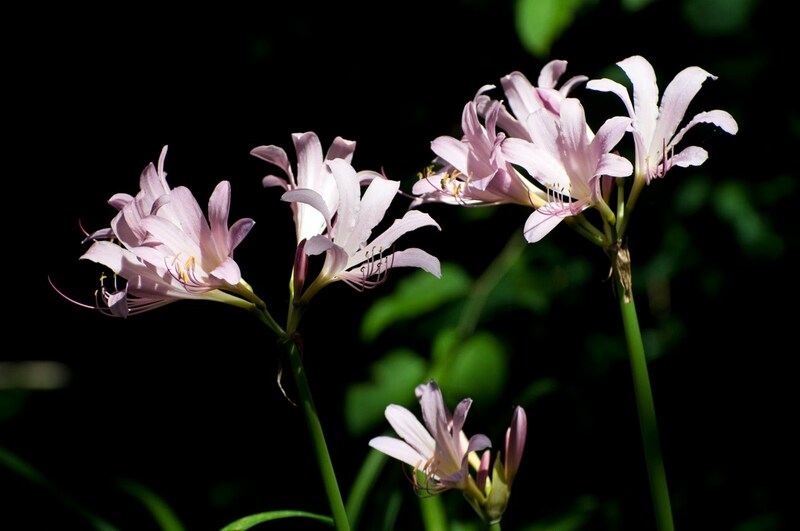 This morning I noticed my Surprise Lilies were blooming in the garden. They live up to their name because they always do catch me by surprise and bloom when I least expect it! They are so pretty with their pale pink flowers. Blood-sucking Conenose, snakes and a hike with the "master of tracking"
One of the interesting things about photographing moths is that I never know what ELSE will arrive at the sheet. 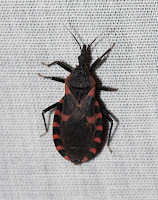 Once I turn on the "bug drug" (the black light), many other kinds of critters soon arrive too. On Friday night I was surprised to see this large red and black bug crawling on the sheet. The warning colors (and the fact it is a true bug with a piercing mouth part) made it obvious that I should leave it alone and not touch it. 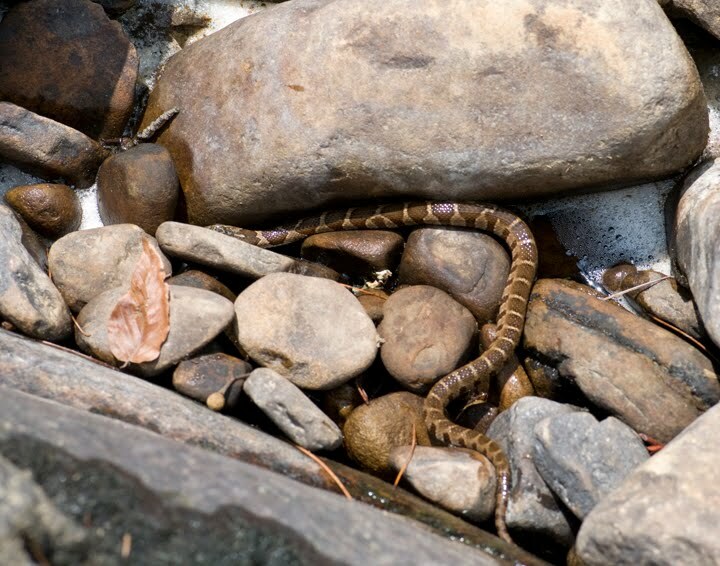 Later, I looked it up in one of my insect field guides and learned it is called an Eastern Blood-sucking Conenose! 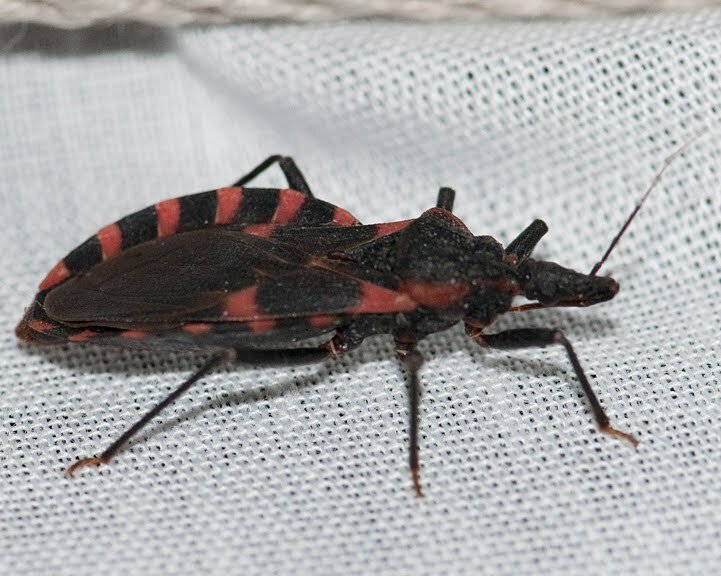 I also learned it has a painful bite that can cause serious reactions in people and they can carry Chagas disease! Yikes! On Saturday I went to the American Museum of Science and Energy to hear Noah Charney speak about the book Tracks and Sign of Invertebrates that he co-wrote with Charley Eiseman. These 2 friends took a 40 day, 15,000 mile road trip across the U.S. to photograph all kinds of eggs, cocoons, insect tracks, etc. They used 5 of my photos in the book (which I received as "payment"), so I definitely wanted to go meet him. After his talk, I took him to the UT Arboretum along with two of my friends who are going to help with the Moth-er's Night Out program there in 2 weeks. I figured Noah might enjoy going over there. I think of myself as being fairly observant when it comes to finding insects and other tiny creatures out in the woods, but Noah put me and my friends to shame! He turned over rocks in the stream and showed us micro-caddisfly tubes. 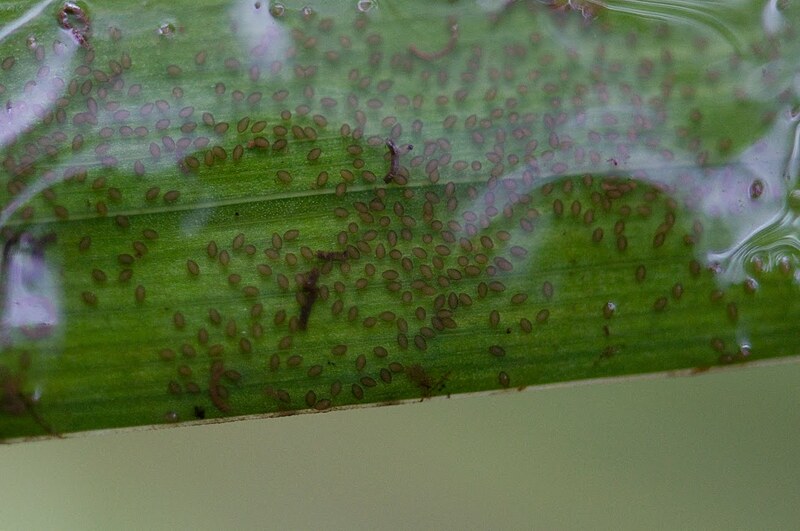 An aquatic iris leaf in the pond was covered with tiny, football-shaped dragonfly eggs. I always thought all dragonflies laid their eggs singly as they dip their abdomens in the water, I didn't know some types lay them in gelatinous masses on leaves. We noticed an ornamental dogwood tree that had been nearly defoliated, of course, we had to check it out. We saw lots of funny looking fuzzy white "caterpilla rs" curled up under many of what leaves were left on the tree. We thought they might have a fungus that had killed them. That is the danger in making assumptions! 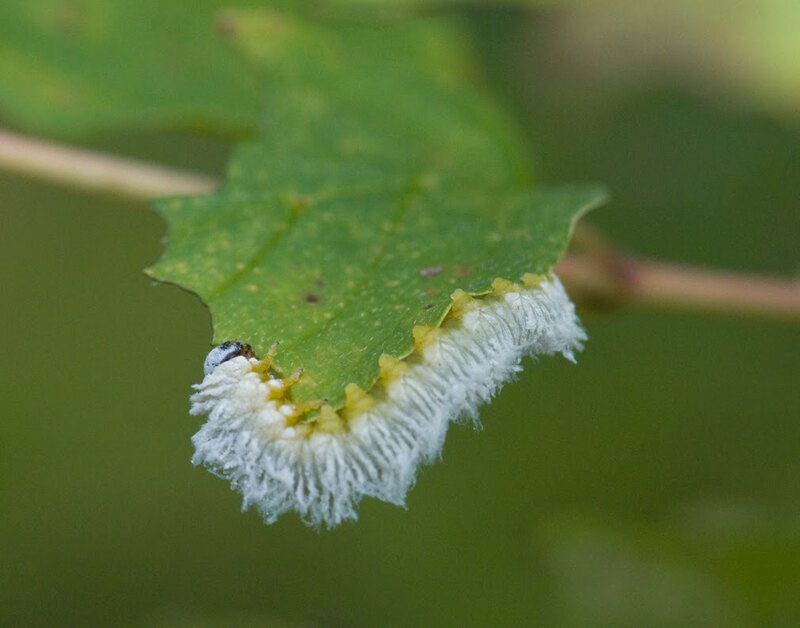 I later looked them up on the internet and found out they were Dogwood Sawfly larvae, not caterpillars. I should have realized that, they have too many "prolegs." They shed the white fuzzy skin to become yellow and black larvae on their 3rd molt, which explained why we saw so many discarded skins on the tree! We also enjoyed watching a black rat snake hiding in the grass. After spending 3 hours and walking less than 1/2-mile, we said good bye. What an interesting afternoon that had been! Today (Sunday) Kenny and I went to Spring City to hike on the Piney River trail. 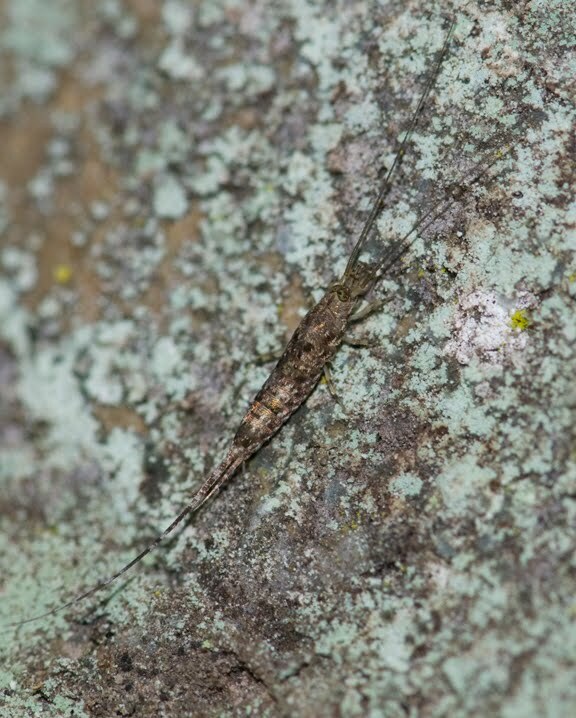 I was anxious to try out my new knowl edge of invertebrate sign hunting! I found a few spider egg cases, molting spiders, rolled leaves with caterpillars inside, etc. Rhea County is notorious for bad weather, so we knew we were taking a chance to go hiking with a 30% chance of rain in the forecast. Sure enough, when we were about 1/2-way to our destination at the bridge 3 miles in, the wind picked up and we heard rain coming through the trees. 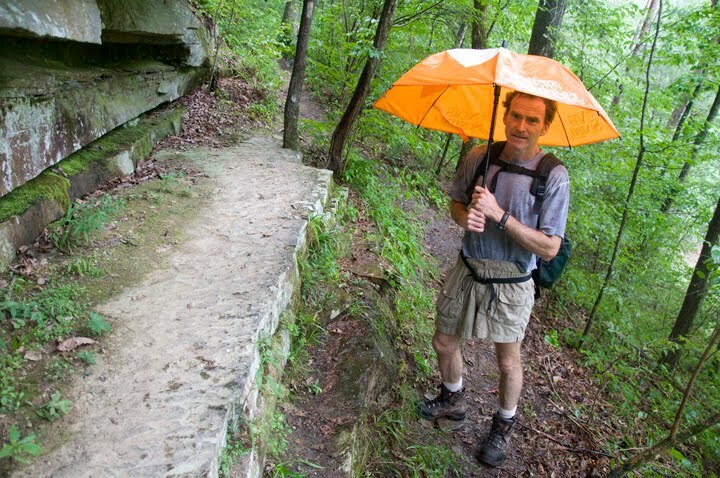 Kenny had packed umbrellas because it was too hot and humid to wear our Gore-tex rain gear. Fortunately, we were close to a long, narrow sandstone rockhouse on the trail, so we went back there and had lunch in a dry place. 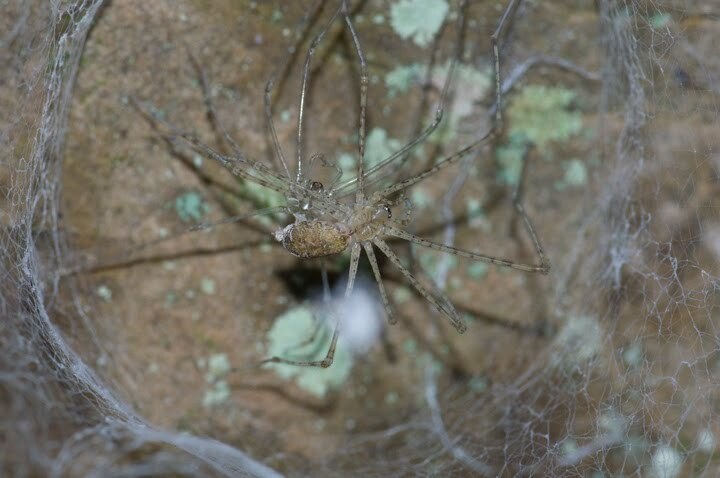 I enjoyed seeing the lampshade spiders, hunting spiders, house spiders and a bristletail under the rocks while we ate and waited for the rain to pass. We seldom see anyone on this trail, so we were surprised when a group of about 2o people who said they had been camping (we didn't see they carrying any gear though!) came walking by. It was a bit unnerving when one guy stopped to talk, he was carrying a rifle and drinking a beer!!! He said the gun was not loaded. Ah, there's nothing like rednecks with guns and alcohol in the woods to add to the excitement of a hike! We decided to turn around at that point because there was a tricky stream crossing ahead that involved picking our way across algae-covered boulders, it is hard enough when it is dry, we just didn't want to risk it with the rocks being wet. So we headed back, but not before taking a detour down to the river. It was a good decision! 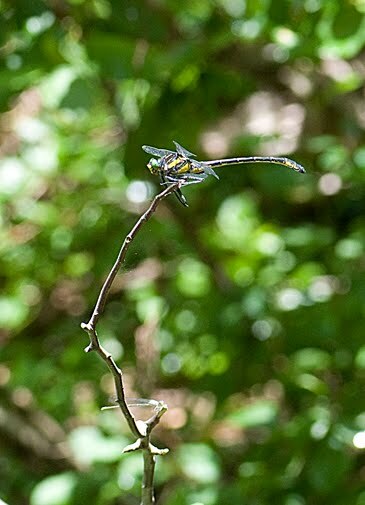 We saw a huge Dragonhunter dragonfly cruising the riverbank. I had my macro lens on my camera, so I wasn't able to get a good close-up, it was on a tree branch 15 or so feet away. These dragonflies live up to their name, although they don't actuall y hunt dragons, I have seen them eat butterflies! 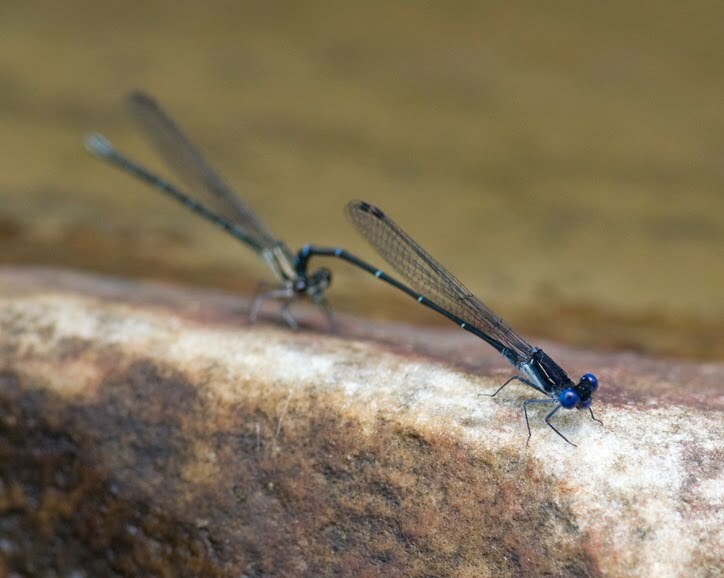 The little damselflies were in the "mood for love", many of them were in the "tandem" position where the male grasps the female behind her head after mating to keep other males away. I liked this little guy's pretty blue eyes!